Left to right: Michael Gottleib, Nada Gordon and James Sherry. In celebration of National Poetry Month, the Museum of Modern Art presented “Transform the World! 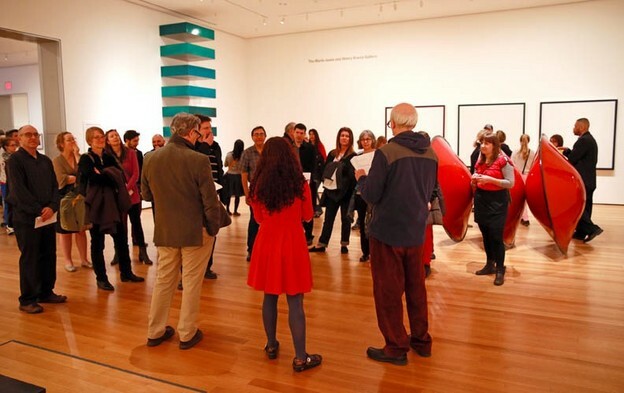 Poetry Must Be Made by All!” For a full hour, the galleries came alive with the sounds of spoken word, as poets read their own works and those of others. Ranging from emerging to established, from conventional to experimental, the poets demonstrated the varieties of U.S. poetry today as they performed under and in front of works of postwar modern art in MoMA’s collection. This event was organized by Kenneth Goldsmith as part of the “Artists Experiment” initiative. Lawrence Schwartzwald witnessed the event and took the photographs reproduced below, which are used with his permission; republication by permission of the photographer only. Top to bottom: (1) Marcella Durand; (2) Pierre Joris behind Bruce Nauman’s White Anger, Red Danger, Yellow Peril, Black Death; (3) Stacy Szymaszek in front of Warhol’s Gold Marilyn Monroe ; (4) Nada Gordon in front of Donald Judd’s Untitled (Stack) ; (5) Simone White; (6) Trisha Low; (7) Pierre Joris and Nicole Peyrafitte; (8) Erica Baum.